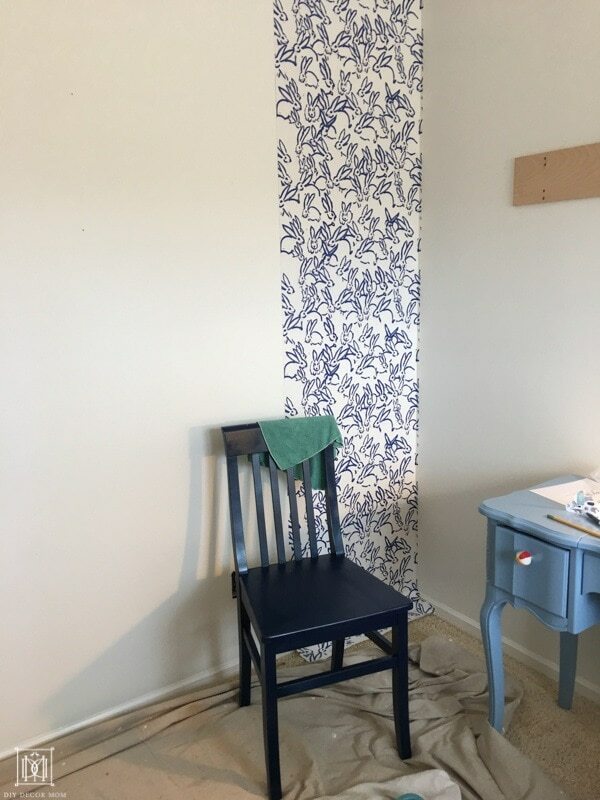 How to Hang Wallpaper: Looking to learn how to wallpaper a room or an accent wall? 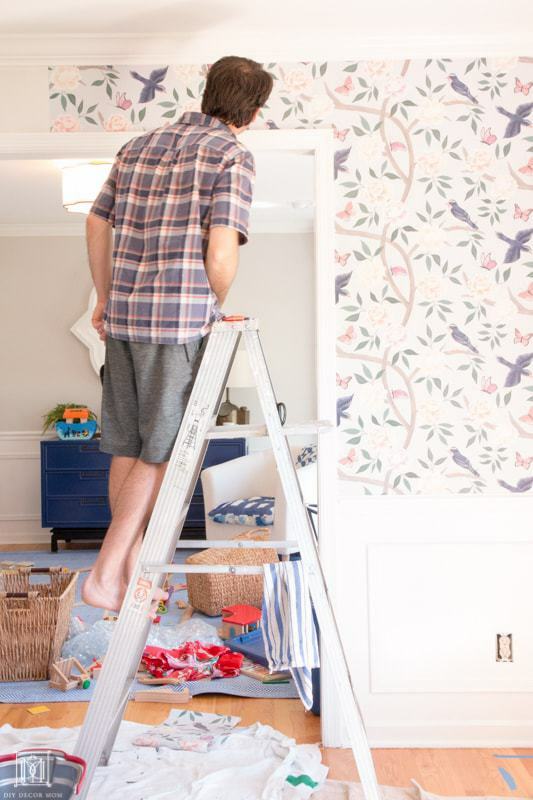 Here’s how to wallpaper a room step-by-step covering everything from how to measure for wallpaper, what type of wallpaper to buy, and how to actually hang wallpaper including corners! Multiply the height and the width of each wall to get the square feet necessary per wall, then add each wall together to get the total area. To account for waste, multiply this step by 1.15 (or 15%). 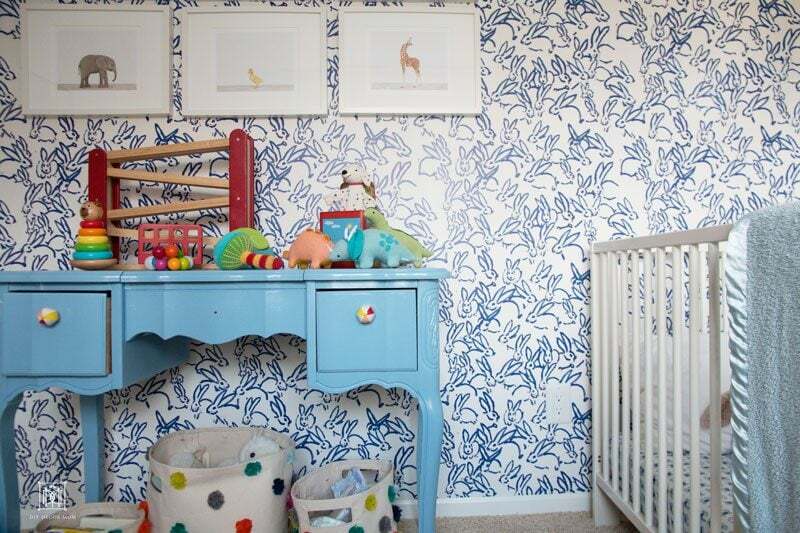 If you have patterned wallpaper, skip to the next step to calculate how many rolls of wallpaper you need. 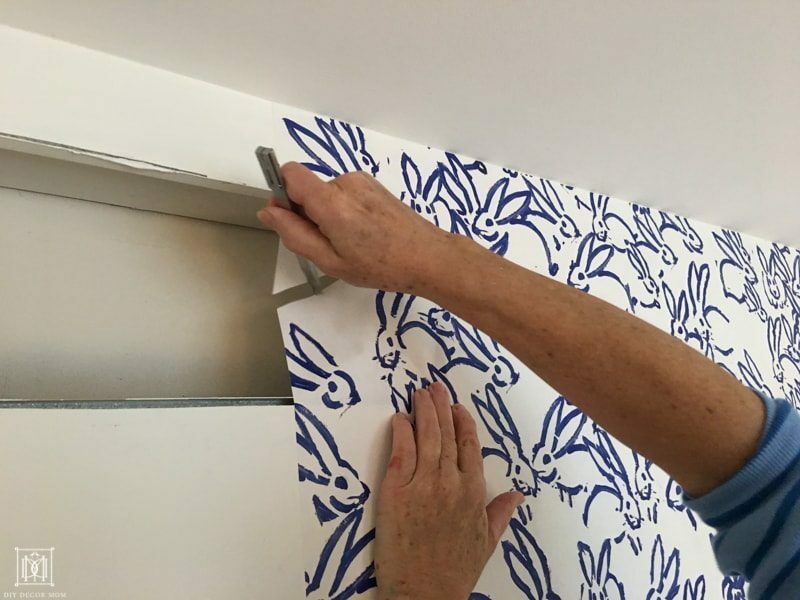 If you don’t have patterned wallpaper: the final step is to take the total area and divide it by the width of a roll (typically 28”). Now you know how many single rolls you need to order. 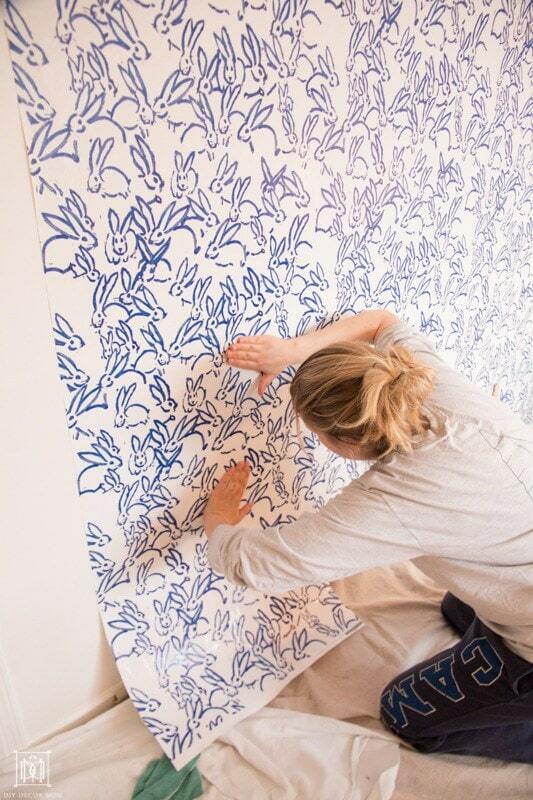 If you have patterned wallpaper: If the pattern repeat is 18” or less, then divide the total area by 23. If your wallpaper pattern repeat is 19”-25” then divide the total area by 20. Is your head spinning? Lucky for you, lots of websites have wallpaper estimators built into them. When in doubt, order more. It’s better to have too much than too little! 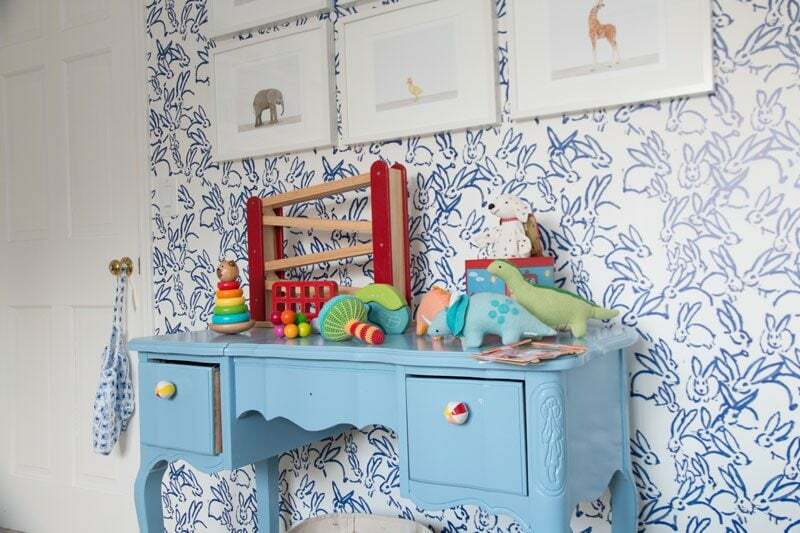 Worried about matching wallpaper to patterns and fabrics? 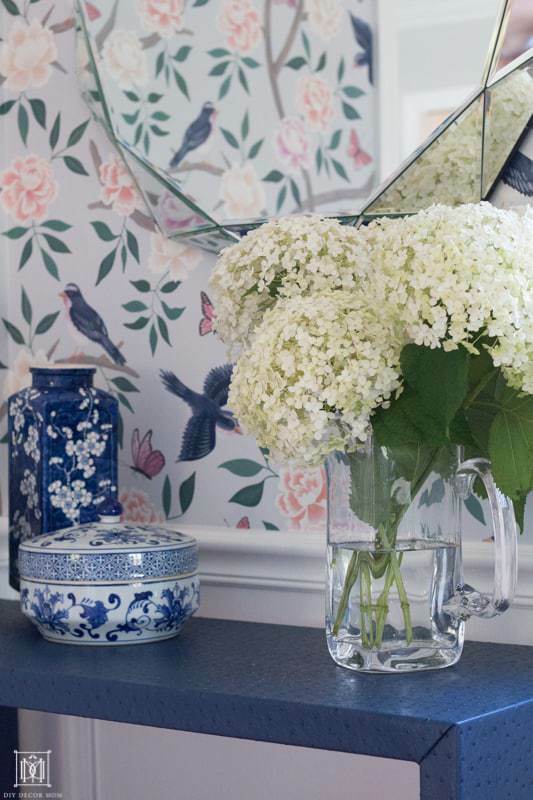 Concerned that your wallpaper might be too bold? 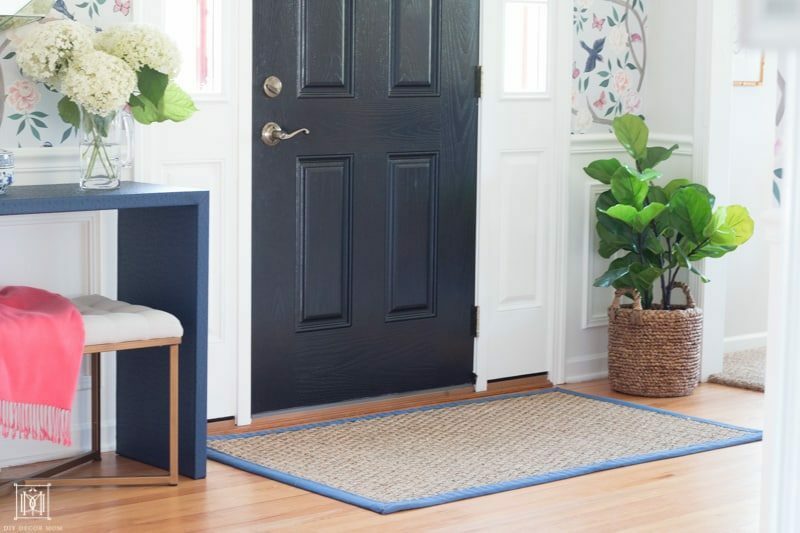 Download the Decorator’s Cheat Sheet which walks you through how to mix and match patterns like a pro, and all the specific dimensions, measurements, and proportions you need to use in your house! 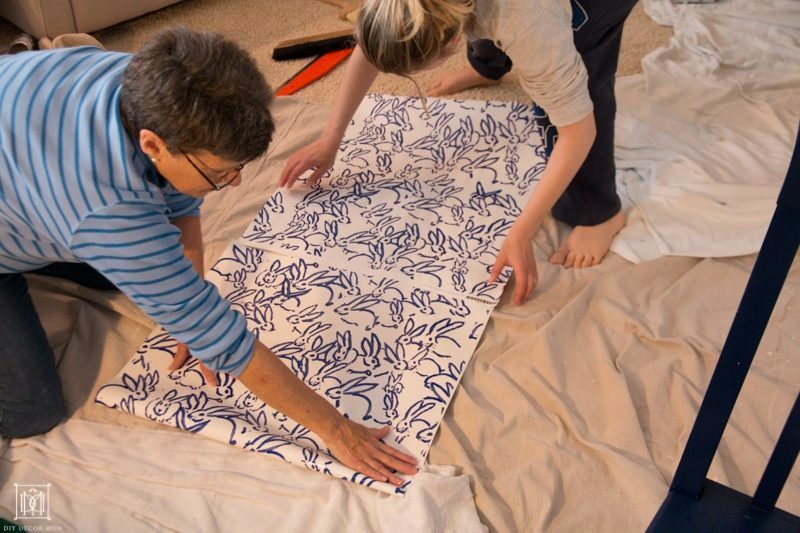 *I do not recommend using seam rollers because they squeeze out too much wallpaper adhesive onto the wall and make indentations in the wallpaper. 2.) 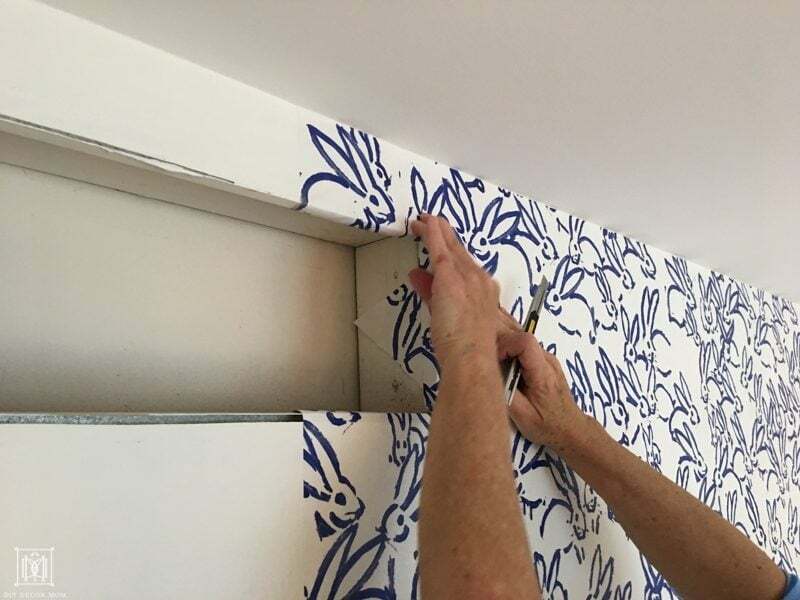 To find exactly where to start: measure out from the corner the width of the wallpaper (usually 28” and subtract ½”) mark this with a pencil. Place a level the mark and draw a vertical line. This will be your plumb line and a visual guide for hanging your first roll of wallpaper. Line the wallpaper up with this edge, and you will have the wallpaper straight! If you have patterned wallpaper (like I did, I relied on the pattern being straight instead of constantly measuring out a straight line on the wall for the leading edge.) But you can repeat the vertical line on the wall all around the room if you would prefer. 3.) Cut the first full-length strip (or if you have wallpaper from custom wallpaper from Spoonflower you don’t need to do this). Plan to leave about an inch of overhang on the top and bottom. 5.) Take the top booked strip aligning it with the ceiling and the lead edge (or plumb line). 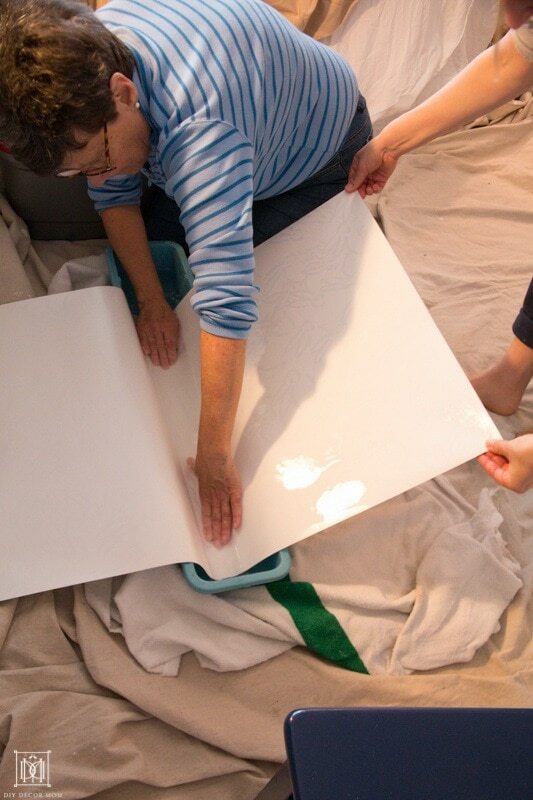 Now, unfold the bottom half of the booked paper and unroll it onto the wall using your hands. Smooth out with your palms any air bubbles larger than a nickel. Gently pull the paper and adjust it so it is vertically aligned. 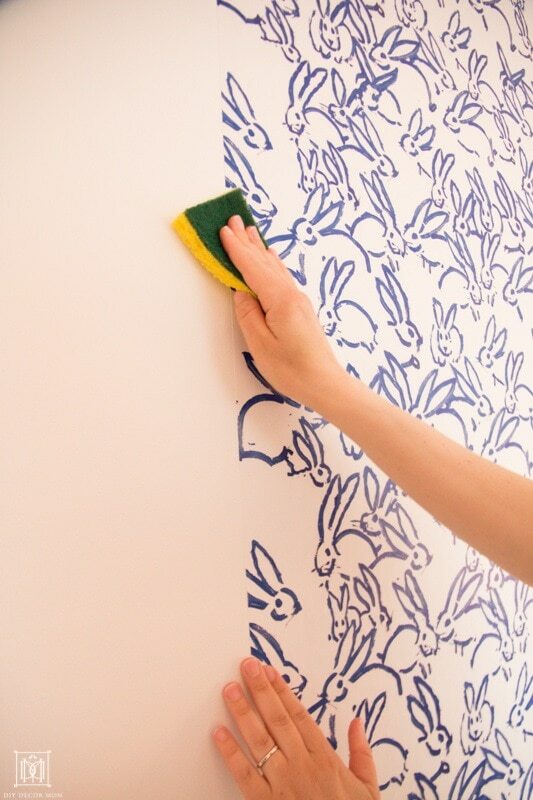 Wipe down the edges with a clean damp sponge to clean any wallpaper paste off the surface. 6.) Trim the wallpaper strip at the ceiling and at the baseboard. First, trim it at the ceiling. Use a sharp razor and a putty knife, and hold the razor parallel to the wall. Again, wipe any adhesive off the top of the wallpaper with a clean sponge. Repeat for the baseboard. 7.) 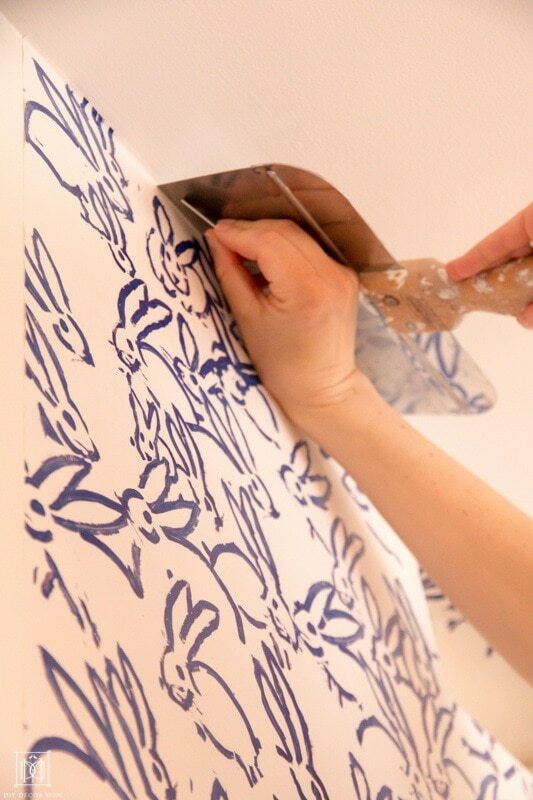 To hang wallpaper on an “inside corner,” cut the wallpaper to the exact size and shape you need. 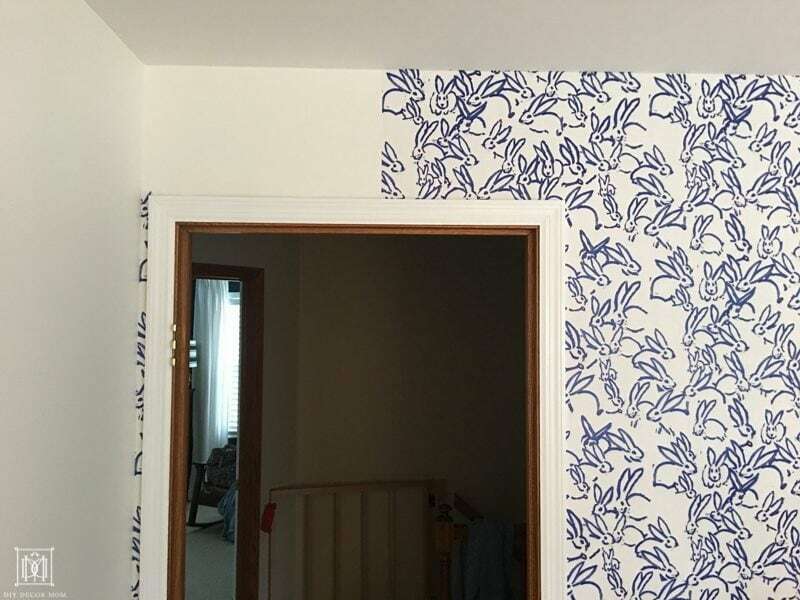 We lined up the pattern with the adjoining strip, and then cut the exact portion out, and then just slide the wallpaper into the spot between the door moulding and the corner. This was a unique case because we were only wallpapering at that point for a focal wall. 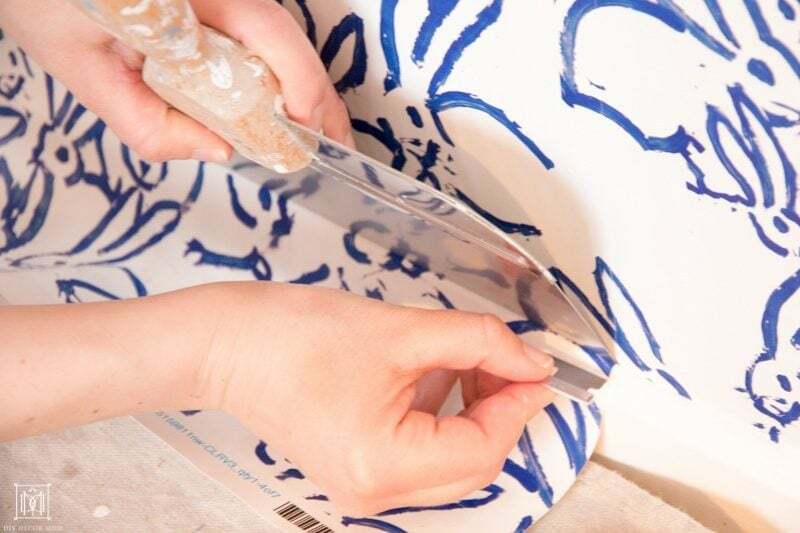 If you are wallpapering two or more walls, then do the following: Hang the paper so the cut edge turns the corner and continues on the other wall. Cut the paper while it is dry, and then wet it and hang it. 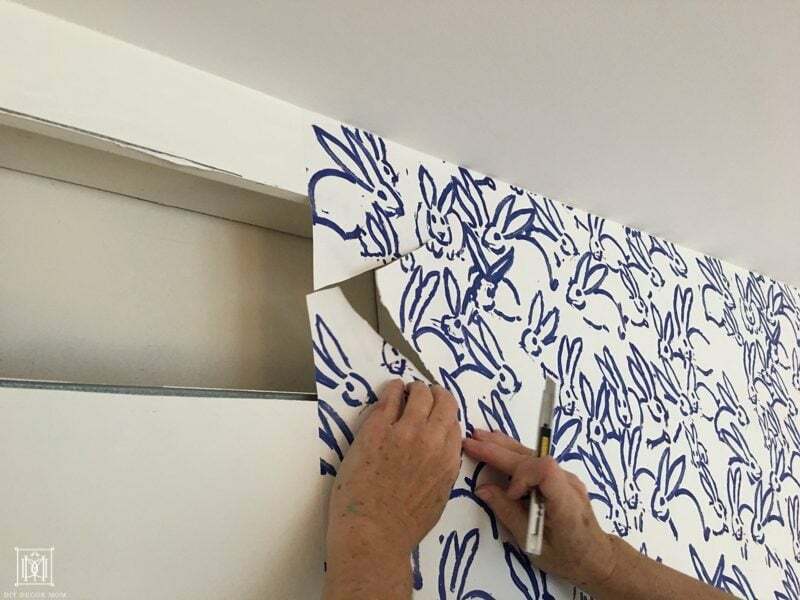 Position the next piece of wallpaper with its edge tucked inside the corner so the pattern overlaps slightly with the cut-edge. For outside corners: Wrap the wall by 1/4″. 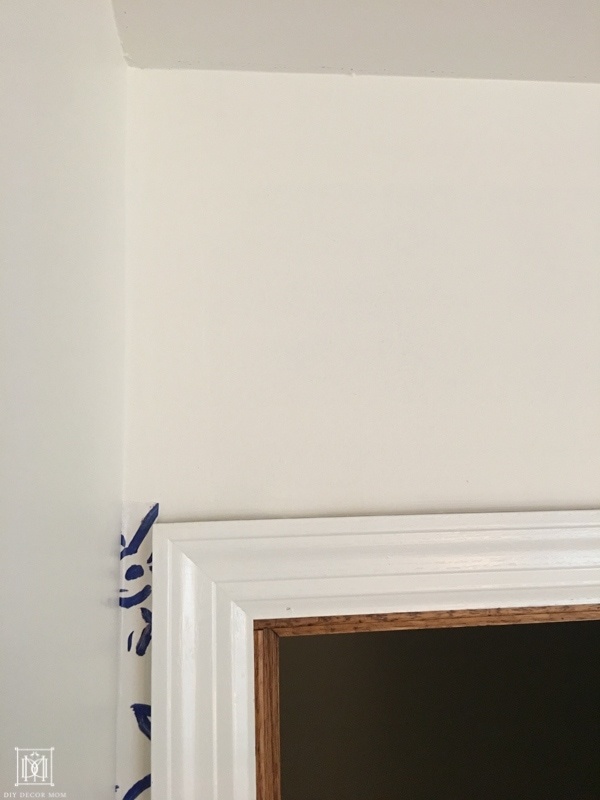 And then trim the second strip to wrap over the adjacent wall by 1/4″ as well. This prevents the paper from peeling upon agitation. Hang your wallpaper so that it hangs over the windows and doors and then use a sharp knife to trim away the excess. Make diagonal cuts with a sharp razor blade to let the paper lay as flat as possible on the wall. We used this technique for vent covers and electrical outlets as well. Wipe off the trim with a wet sponge after you are done cutting away the excess. 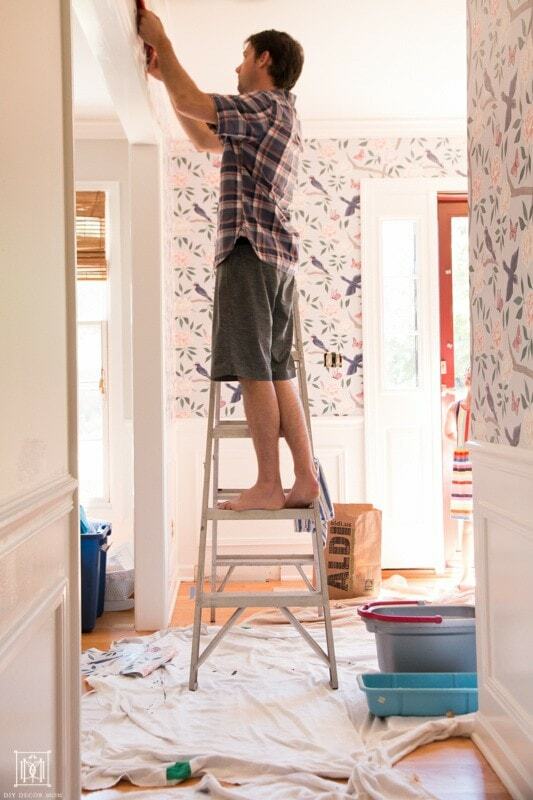 Where do you start when hanging wallpaper? Generally, I like to start on the biggest stretch of wall where the wallpaper starts especially if it’s an accent wall.) 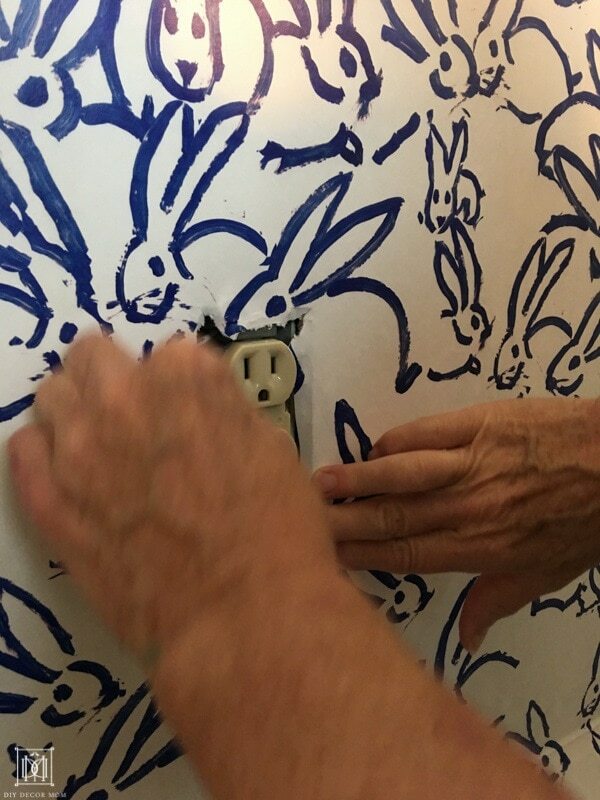 To find exactly where to start: measure out from the corner the width of the wallpaper (usually 28” and subtract ½”) mark this with a pencil. Place a level the mark and draw a vertical line. 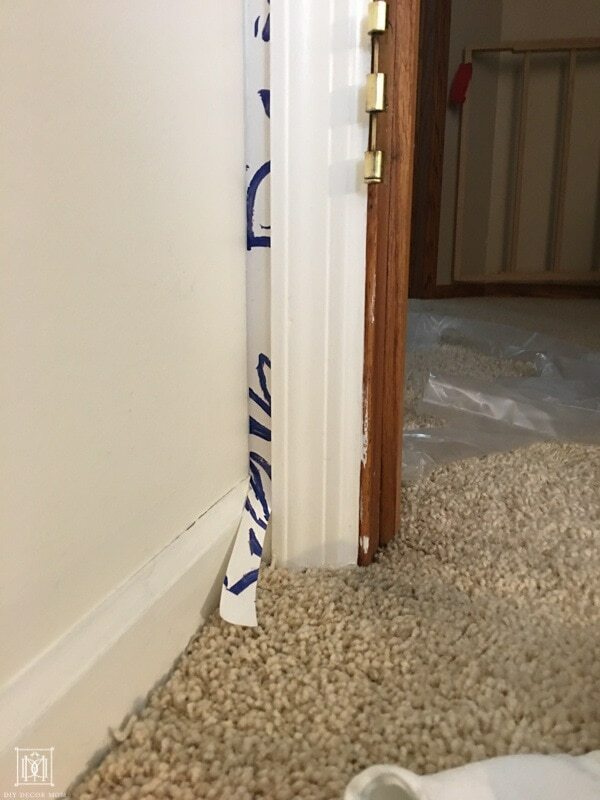 This will be your plumb line and a visual guide for hanging your first roll of wallpaper. Line the wallpaper up with this edge, and you will have the wallpaper straight! 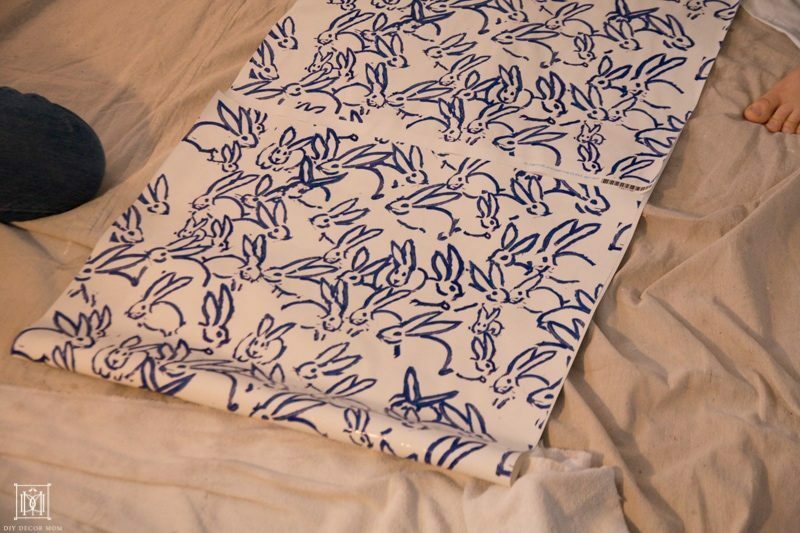 Should I buy prepasted or removable wallpaper? 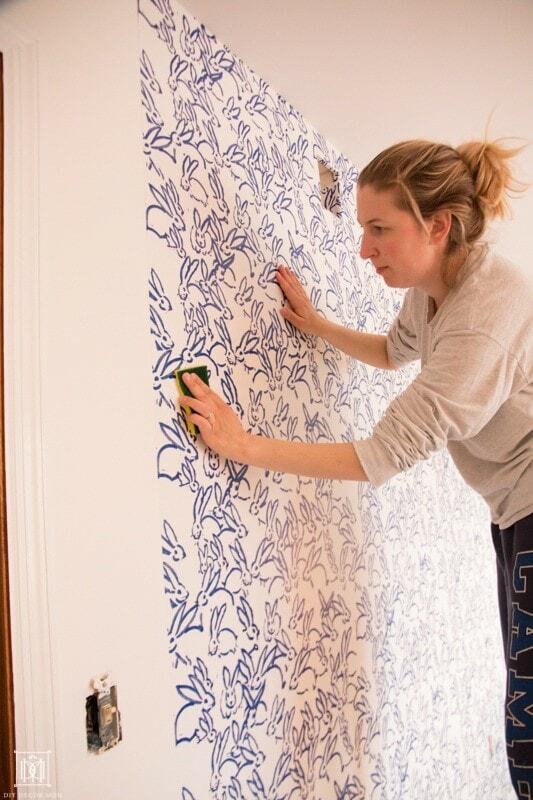 Personally, I find hanging traditional prepasted wallpaper is easier than hanging removable peel-and-stick wallpaper. Prepasted wallpaper is more forgiving for beginners because it doesn’t immediately adhere so you have a little more time to make sure it’s straight and correct it. Can wallpaper be hung horizontally? Yes, although most patterns are designed to be hung vertically. To be honest, I’ve never hung wallpaper horizontally; but, to do it, instead of drawing a vertical plumb line, you would want to draw a horizontal line with a level, and measure from the top of the ceiling down by the width of the wallpaper. 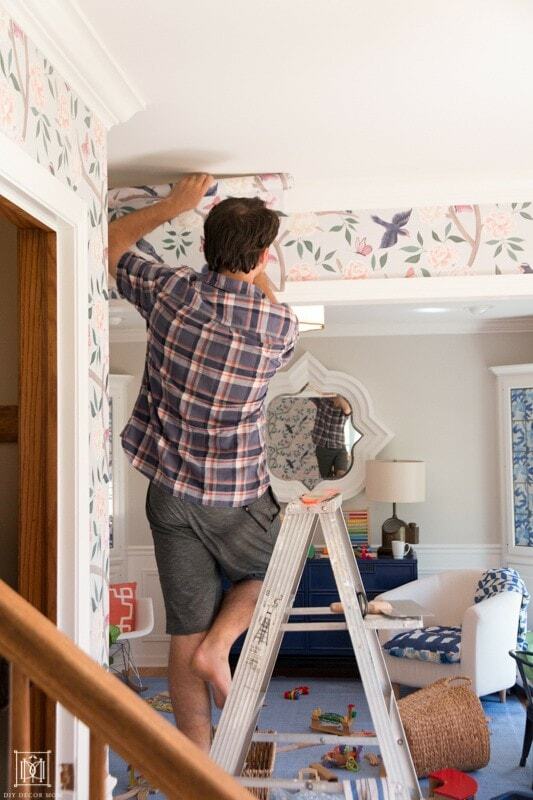 What do you need to hang wallpaper? 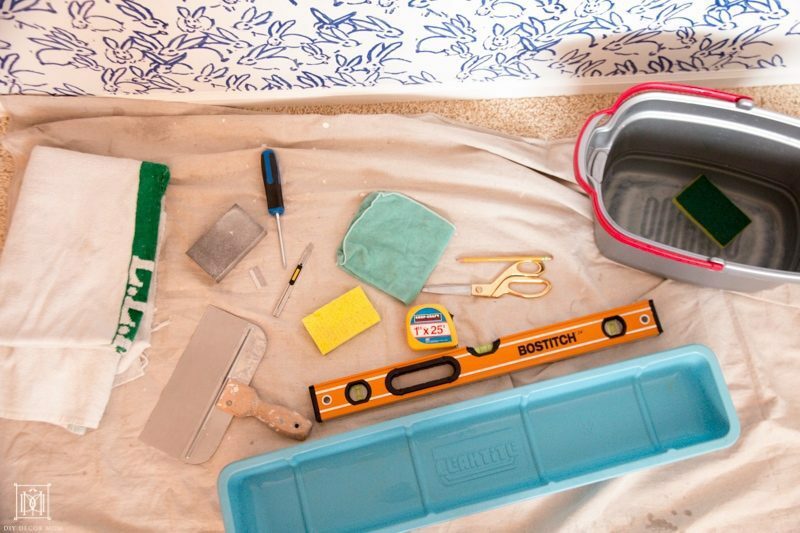 To hang wallpaper, you need a few things: a measuring tape, a level, a pencil, a sponge, a tray or bucket with water, and some towels. I’ve always DIYed hanging wallpaper, so I don’t have firsthand knowledge; however, according to Google, a ballpark estimate for hiring out hanging wallpaper is between $4.90 and $8.68 per square foot. Or between $365 to $725 depending on the size of the room and the difficulty. To make putting up wallpaper more affordable, you have lots of options: do an accent wall to minimize the amount of wallpaper you need. 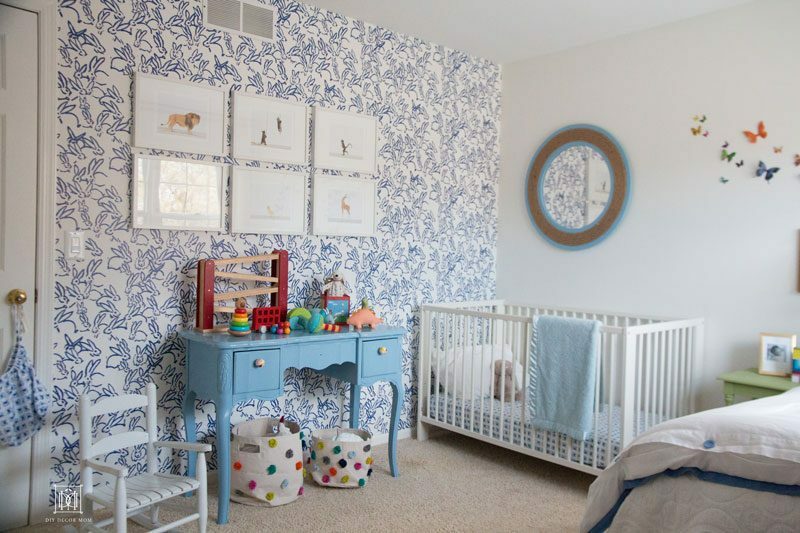 Choose a wall that is a focal point for the room, and you won’t even notice that it’s not all wallpapered. Second, you can install some sort of moulding or paneling to minimize the amount of wallpaper. For our front hall, to minimize the total area of wallpaper needed, we added DIY Wainscoting. This cut down on the amount of wallpaper by 30%. If you do tall board and batten, it would be even more! 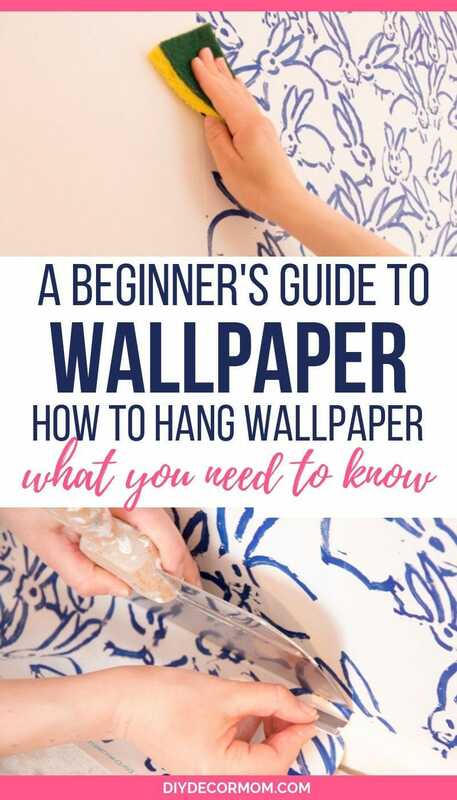 I’ve only hung prepasted wallpaper, so this tutorial is exactly how to do just that. 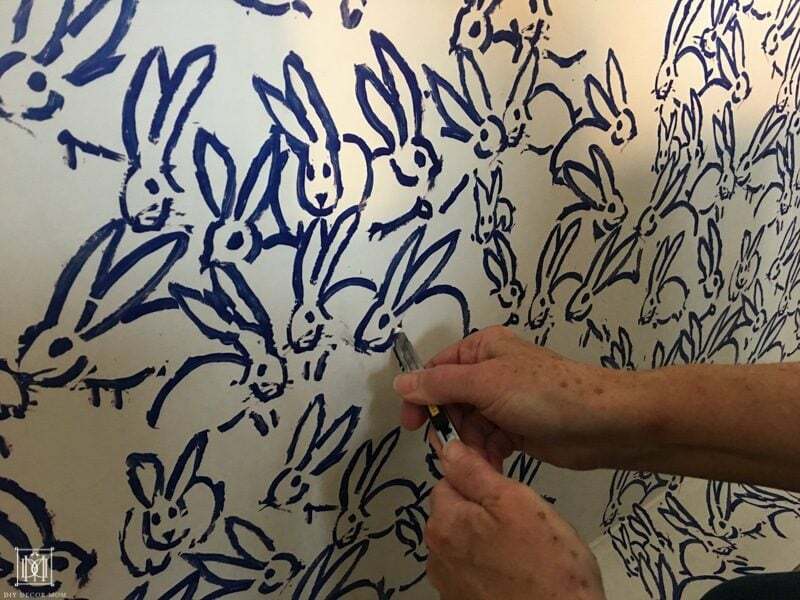 See the finished room with blue and white wallpaper bunnies here and the finished chinoiserie wallpaper front hall here! Plus, don’t forget to download your cheat sheet to a beautiful well-decorated home here!